Wayne Gurnick AIFD / Moments By Wayne is included in the recently published Nicholas Purcel Studios list ... "100 Best Wedding Planners in the World: 2018"
Inspired weddings take place in different locations -- vineyards, hotels, country clubs, social halls and parks. But the most romantic, emotional and personal weddings that I've ever seen were those at a family's home. Spring time is particularly well suited to entertain at home. To pull off that perfect home wedding, consider these important "Do's". After the question gets popped, new planning questions crop up. 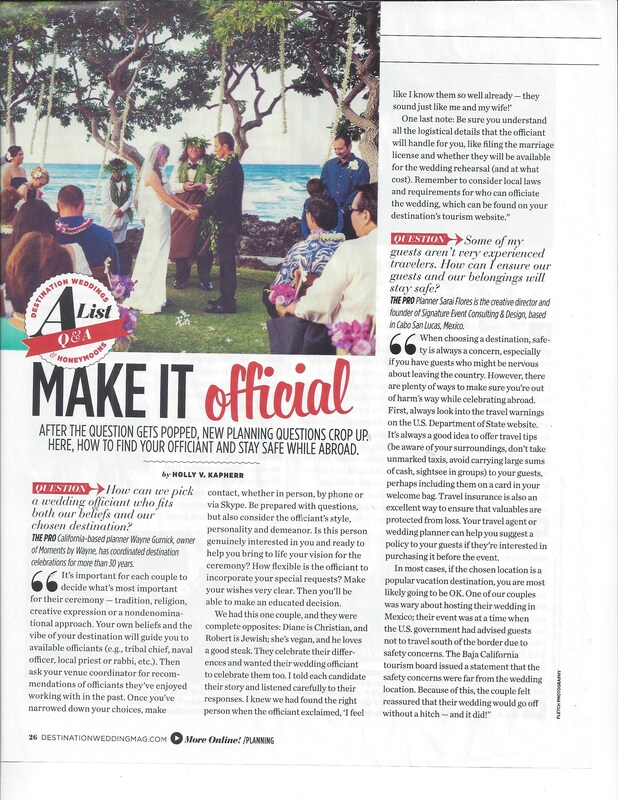 Here, how to find your officiant and stay safe abroad. She is a vegan and he loves a good steak; she is Christian and he is Jewish. They celebrate their differences and it was obvious to me when I would see them together that they love each other deeply. We celebrated the idea of opposites in every aspect of the wedding, and just like De and Roger, everything blended together beautifully. She is a vegan and he loves a good steak; she is Christian and he is Jewish. They celebrate their differences and it was obvious to me when I would see them together that they love each other deeply.We celebrated the idea of opposites in every aspect of the wedding, and just like De and Roger, everything blended together beautifully. As a wedding planner, you organize and plan one of the most special days in a person’s life. One of the best ways to generate ideas is by watching the top wedding planners. Below are 25 of the most influential wedding planners in the world. Read more. Today though I am featuring an interview we did with Wayne where he shares his philosophy on floral design, finding inspiration and working in the wonderful world of weddings. Read the complete interview. YOUR FEEDBACK MEANS SO MUCH! "How do we begin to thank the man who made it all possible? You brought such an unreal amount of creativity to our wedding, compiled a teeam of the best vendors, and created a weekend that has left us with unough joyful memories to last a lifetime. Our biggest thank you though, goes to the way you made us and our families feel throughout the process. Planning a wedding is an opportunity to bring a big new family together, and you were absolutely paramount in creating the happiness and closeness that our families have today. "We can't thank you enough for the wonderful work that you and your team did in planning our wedding. Thanks to you, the planning process was enjoyable and we had a brilliant day!" "Thank you so much Wayne!! Best day ever!" "I will never forget all that you did for us...you are extraordinary and amazing beyond words!" "Just another thanks for a super, extremely professional job. Diligent, totally reliable, all done with an omnipresent smile. These are just a few words that come quickly to mind. However, I must know how you successfully defied a basic law of physics: 2 places at one time-doable (doppelganger); 3-4 places at one time, physically impossible. I just wanted to say thank you to both of you! The bar mitzvah last night was a HUGE success! The day turned out to be better than I could have ever imagined. Services were perfect (JJ was fantastic) and then I came home to have had Karter set up my house beautifully. She is a gem! She handled everything perfectly and allowed me to enjoy the entire party. She was on top of everything and made good choices and was super professional. The carnival booths were incredible (I already sent Ron from Signature a thank you)- the kids had a ball (they didn't want to leave). His staff were professional and sweet and kind. The Tommy's truck was also a huge hit. My only regret was that you guys weren't here to celebrate with us. "I just wanted to say thank you! The bar mitzvah last night was a HUGE success! The day turned out to be better than I could have ever imagined. Karter set up my house beautifully. She is a gem! She handled everything perfectly and allowed me to enjoy the entire party. She was on top of everything and made good choices and was super professional.The carnival booths were incredible - the kids had a ball (they didn't want to leave). His staff were professional and sweet and kind. The Tommy's truck was also a huge hit. Thank you, thank you, thank you!!" "Thank you, thank you, thank you for "organizing and orchestrating" our amazing wedding! For us...it was the perfect day and we couldn't have done it without you!" "I could not have done Ali's picture perfect wedding without you! Thank you for orchestarting the event and holding my hand. The wedding was perfect with lots of thanks to YOU! I can't tell you how much we enjoyed working with you these past few months, too." "Just wanted to send a quick thanks for all of your hard work and for doing an incredible job on coordinating my wedding! It was a magical night and you really made sure everything ran smoothly and allowed me to fully enjoy every moment. Everything was gorgeous from the chuppah to the flowers, ballroom and even our suite. I really appreciate it!" "Wayne! Lisa and I want to thank you for doing such a great job this weekend. We are in the limo, heading home, and started talking about how smoothly everything went. You were great - we really appreciate it. Julia and Jenn were amazing. Thank you - it literally was the best night of our lives. Love, Lisa and Doug"
"Thank you for today. Everything was wonderful in every way. I appreciate you calm, focus and kindness. I hope to work with you again and refer you to everyone I know!" "Wayne, I had great time at our wedding, I am finally done with the wedding hangover. You made our wedding so great, I wanna do it again!! haha ( of course with Stephan). I just wanted to say thank you, and wish you, your family and your business the best. Guests also loved the wedding so much, the candy bar was a huge hit!" "Thanks Wayne! I don't know what we would have done without you. You were everywhere and just left no stone unturned!!! We had a wonderful time and didn't have to worry about a thing because you took care of it all. Thank you again for giving Jenny the wedding of her dreams. You and your staff are one of a kind." "Thank you so much!!! Everything was particularly perfect!!! Wayne is AMAZING, Julia was great and Josephs designs BLEW my wildest dreams!!!!" "Good times last Saturday Wayne! Thank you for being flexible and easy to work with. It was definitely a pleasure working with you as you made my job so much easier. Looking forward to many more events in the future." "Thank you, Wayne for the most amazing day of my life! Words cannot express my gratitude for all of your time and talent in making Sean ♥ Kristina's Wedding absolutely PERFECT! You are so truly gifted and we certainly appreciate you putting those gifts to work for us!" "Just wanted to take a moment to send you my heartfelt gratitude for all you did to make our wedding day a perfect experience. Your attention to detail and your professional yet lighthearted demeanor was the perfect match to make us a good winning team. Walter and I were both overjoyed with your flawless execution of each detail. Many of our guests commented how every detail was attended to ... whenever they thought of something, it was already handled or anticipated. What bride could ask for anything more? Most importantly we had a fabulously, fun time at our wedding because we knew that you would take care of all the logistics. Thank you, thank you, thank you." "I just wanted to thank you so much for everything and all of your help. We've been with family and have spoken to friends since the wedding who would not stop commenting on how professional you were and how you made everything run so smoothly! You're truly the best at what you do, and I really was blown away at how you just made everything so seamlessly smooth and perfect! You're a gem and a rock star in one! With Gratitude, Sasha"
"First and foremost, I just want to thank you for everything you did. Honestly, without your help (and Jen’s) I don’t think my day would have been as special as it was. Thanks again for everything." "The wedding was absolutely amazing and so was Wayne! We couldn't have done it without him. The whole family had so many compliments about him and he truly went over and beyond." "Everyone in my family involved in the process stated how lucky I was to have hired Wayne. He surpassed my expectations. He was an excellent day of coordinator." "I always sound up for great jobs. You were 11 on a scale of 0-10. Thanks for everything." "Wayne gave me the best advice and tips, he is extremely organized, vendors to go to, and most of all made sure my day went smooth!! And everything came from his heart and soul; it felt like he was at his own daughter’s wedding. He made it very comfortable to work together and couldn’t imagine the day any different! Thank you Wayne!!!" "Thank you for being game enough to jump into this fiesta grande. We are so appreciative of your big heart, terrific organization and wonderful design sense." "You gave us one of the greatest gifts a parent can give their child. Julie said it was the best day of her life. What more could we ask for but to bring our child such happiness on her wedding day?"